PHP 220 was a Daimler CVG6 demonstrator of 1952 with a Northern Counties H33/28R body bought by Burwell and District in 1956 and withdrawn in 1972. It is seen here on 26th August 1959 in Drummer Street bus station, Cambridge (nowadays altered beyond recognition from its early layout) leaving on its way to Soham. It is passing one of the numerous Eastern Counties lowbridge K5Gs. Eastern Counties had very few low bridges in its territory, but allocated lowbridge double deckers to most of the country routes, keeping the highbridge fleet employed mainly on the Norwich and Cambridge town services. The contrast in refinement between the preselective, flexibly mounted, six cylinder highbridge Daimler and the rigidly mounted, five cylinder, constant mesh, lowbridge Bristol could surely not have been greater. I well remember being very impressed by this lovely vehicle when, as a demonstrator, it was on loan to Leeds City Transport. I recall seeing it near the Town Hall on service 42 to Lower Wortley – can anyone recall if it was in some kind of deep purple, very dignified, or is the grey matter here really failing now ?? I was on that very last journey on June 6th 1979 and still have the ticket to prove it. 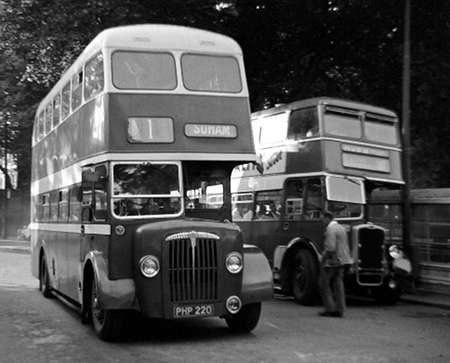 It was operated by four Fleetlines and there was a certain amount of jockeying for position by the drivers in order to claim the title of the last Burwell bus to leave Drummer Street Bus Station. Our bus (9 DER) driven by Jim Neale, a relation of the Mansfield family, gained that honour although it wasn’t the last to arrive back at the depot. I recall that villagers stood at their garden gates and waved goodbye as the final service passed by. Chris, Peter Gould gives the production date of PHP 220 as 1952, but Paul Carter, a highly respected expert on East Anglian operators, says it dates from 1954. When was it on loan to Leeds? Can anyone verify the issue date of the registration? I plumped for 1952 in the above text as the 1954 date seemed rather late for a demonstrator of such a very well established vehicle type. Volume 4 of Leeds Transport says that it was on loan from 24 August to 14 September 1954 and the livery was "maroon and cream without lining". Many thanks for that reassurance Trevor – at least my memory of the colour, while not 100% accurate, wasn’t too far wide of the mark. Mind you,in September 1954 I had other things on my mind, having just received from Her Majesty such a kind invitation to join her troops in blue on October 20th for a two year "event". Regarding the issue date of the registration of PHP by Coventry. I have two books which give details of various histories, issue dates, etc, of UK registrations. Both agree that Coventry started to issue PHP in July 1954. The next mark (PRW) followed in September 1954. So this would narrow down PHP220 to the summer of 1954. If the chassis dated from 1952 as suggested above, perhaps it was used by Daimler for it’s own internal purposes (or on trade plates?) before it’s use as a demonstrator. That’s just my speculation – I have no documentary evidence on Daimler’s use of the chassis, or when the body was built. Bus Lists on the Web gives the date new as being 1954. But according to the recent PSV Circle publication regarding Daimler Chassis Numbers 16685 etc, the bus was built in 1952 as the 4th prototype CL lightweight chassis. Bodied in 1952 and first registered as a demonstrator in 1954. Sold to Burwell and District in March 1956. Re-designated as a CV by Daimler. I also think that the shot above was photographed at Middlewich not Northwich. ‘A History of Motor Vehicle Registrations in the United Kingdom’ by L.H. Newall shows that the County Borough Council of Coventry issued PHP marks from 7/54 until 9/54. ‘Bus Lists On The Web’ gives a date new of 1954 on the Northern Counties body list, and the chassis number seems to point to much the same date. Coventry’s 1951/2 batch of CVD6s had KVC registrations, and their next delivery, CVG6s delivered in 1955/6, were RWK. So all the evidence appears to indicate that when this vehicle was on loan to Leeds, it was very, very, new. Stephen’s account of the history of this vehicle is endorsed by Alan Townsin’s book on Daimler published by Ian Allen. If I had looked in my copy first I would have found the answer. He says that chassis 18337 was one of the CL prototype lightweight chassis of 1952, which suggests that it began life with a Gardner 5LW engine and the power hydraulic braking system of the CD650. It eventually emerged for psv use as PHP 220 with a lightweight Northern Counties body in 1954, by which time it had become a CVG6 with conventional vacuum brakes. I understood that the reason for lowbridge buses in the Eastern Counties fleet was the restricted headroom in their Ipswich depot and bus station. PHP 220 was acquired by B&D on 5th April 1956 and sold on 7th January 1972. While with B&D air brakes and gear change were fitted. Jim, the air-operated preselector was quite new to Daimler in 1954, having been announced that year as an option on the Freeline; according to a leaflet somebody sent me a scan of. Stephen, the newest B&D Freeline with vacuum brakes was NVE 1, built in 1954. only the last 2, built in 1958/58 had air brakes and gearchange. An amusing anecdote regarding the air-change on PHP was of a part-time driver, not familiar with the system parking on the bay in Drummer St. bus station leaving it in reverse gear. (i.e not engaging neutral by depressing the pedal after selecting). After tea-break and a slight air-leak when the engine was started the bus was stuck in reverse gear which required half of the bus station to be cleared while the embarrassed driver reversed round far enough to build up enough air-pressure to disengage reverse and then engage a forward gear to proceed. The same P/T driver was also embarrassed a few years later when driving a Fleetline for the first time. He parked in Drummer St., opened the door with the gear selector and stopped the engine. When it was time to depart he pressed the starter button and nothing happened as the gear selector was still in the door position. After a few moments fiddling and no sign of life the Conductress was about to go to the phone box to call for assistance. I was a 16 year old passenger sitting on the back seat and knew what to do so made my way to the front of the bus, flicked the gear selector in to neutral and pressed the starter button and we were away. I don’t think the driver liked being shown up by a teenager like that but I went on to drive many more miles in that bus than he ever did! I’ve one question from your original post info, Roger. Did the family sell the company to Eastern Counties in the end, or at least the goodwill, since EC didn’t buy their vehicles? Jim. Vacuum braked Freelines? I have only previously heard of hydraulic or air. Stephen, To be honest I am not sure about the difference between vacuum and hydraulic brakes. I know the earlier Freelines did have a peculiar system which also involved the gear-change pedal but my experience driving them was very limited and I was only 21 at the time as most buses and coaches that I have driven have had air brakes. Yes, Chris, according to Paul Carter in his writings on Cambridge area operators, Burwell sold out to ECOC after all other approaches to independents proved fruitless. Paul’s book, "Cambridge 2", includes some reminiscences by Jim Neale about his time with Burwell & District and afterwards – well worth a read. Turning to the Freeline braking question, I, too, can find no reference at all to a vacuum braked option. The power hydraulic braking system with which Daimler became rather besotted was the standard fitment to the Freeline, but Daimler very quietly introduced an air braked option in 1952. I cannot discover just how many Freelines had air brakes, but surely the eight that went to Great Yarmouth must have been so fitted. Geoff Hilditch is unremitting in his loathing of the brakes of the Halifax CD650 ‘deckers. He would assuredly not have ordered Freelines with the hated hydraulic system. Incidentally, the Freeline had a high driving position because the spare wheel was located beneath the floor at the front of the chassis. On the subject of the power hydraulic braking, steering, gearchange system, one wonders why Daimler became so wedded to this arrangement. The AEC Regent III had shown the way forward with air operated brakes and gearchange, and power assisted steering was always a possible extra fitment to any chassis if required. Daimler had previously adopted air brakes entirely successfully in its trolleybus chassis from 1936 onwards, so the firm was fully familiar with the system. Power Hydraulic braking was never popular with the operating industry, and apart from the special cases of London Transport’s RMs and Midland Red’s D9s, bus operating engineers elsewhere generally kept well clear. Those chassis that did have the full hydraulic system didn’t sell very well, witness the Dennis Lancet UF, Foden PVD/PVSC and the Tilling-Stevens Express MkII. No doubt other correspondents can think of some more examples. G. G. Hillditch did indeed specify air-operated brakes and gears (Daimatic) on FEX 524-5 and AEX 18-20B: he also had fitted Gardner rather than Daimler engines. He detailed the specification process in "Looking At Buses". Some pictures of the last days of Burwell & District may be found here:- http://angliaandthamesvalleybusforum.com/index.php? With reference to Stephen Allcroft query re: Freeline vacuum brakes. I think what Jim meant was "Servo (vacuum) assisted hydraulic system" Lockheed called this "continuous flow system" It was also use3d on a lot of early Routemasters.